I’ve loved all your incarnations since I was a wee lass. They have fueled my passion for the perfect man. For the pithy quip. For the way to get something done just so. I loved you as Sean Connery, and Pierce Brosnan and Roger Moore. Then, when I thought it couldn’t get any better, here comes hunky Daniel Craig, who was all smart and lovely and so. damn. beautiful. in Casino Royale. THIS Bond was resourceful and even more charming and so human and so lucky and so … well, he fell in love. Even when he was strapped all nekkid in a chair and beaten silly on his manparts. My heart ached, physically ached for him. For Daniel. For the life we could have together if he could just get out of that chair! And come to America and find me! And decide that we’re great together and get married, not just for the green card! Because he doesn’t need one anyway, as an international spy! 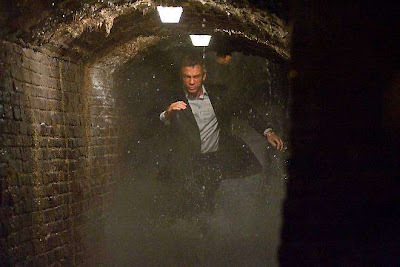 So today, with a belly full of leftovers, I traipsed — traipsed, mind you — to my local theater to watch Bondliness wonders unfold in “Quantum of Solace.” First of all, where did you get that title? Did you drink a bunch of tequila, blindfold yourself with your tidy whities on your head, flip open the dictionary, land your finger on “Solace” and “Quantum” and decide to just go for it? Did you enlist a brain trust from Oxford to find the perfect title, then go on Babelfish to translate into German, Spanish, French, Dutch, Esperanto and then back to English, and this is what came out? Did you outsource it to India? WHAT THE HELL DOES “QUANTUM OF SOLACE” MEAN???? It sounds like a euphemism for something, as in, “Dude, I downed a quantum of solace last night and I’m not going to be able to make your wedding. Sorry about that.” It sounds like some obscure Medieval measurement, as in, “Sire, I must reveal that we’ve only a quantum of solace left in the entire shire. Surely it will not last the winter. What shall we do? Oh! Heavens! I shall ring a large bell and kill some peasants!” But enough with the title. Whatever. James, I KEPT WAITING FOR THE MOVIE TO START. There was that insane violent car chase through all the Italian tunnels. Then some more stuff exploded. Then some people got shot. Then you made it with a lady. Then some more people! Then Dame Judy Dench was lovely and sassy with the meager amount she was given. And you threw your dead friend in the Dumpster! Then some more stuff exploding! And then it was over! Honestly, James, I thought you’d be more resourceful. Yeah, you with a bloody face in a tuxedo is kind of ruggedly handsome the first time. We got that. Okay, enough already, you don’t have to do it, like, EIGHT TIMES IN ONE MOVIE. I don’t know if it’s good enough, anymore, to have your leading lady seek a revenge killing for the evil dictator that raped her family and burned down their house. Can’t we think of ANYTHING ELSE HERE? Can’t we transcend the hackneyed, puhleeeeeeeeeze? For now, James, you’re on probation. And might I suggest several 12-step groups for you?